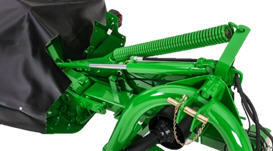 The disc mowers use the hydraulic cylinder to lift the cutterbar from cutting to the transport position, where the cutterbar automatically locks into place. The R160 and R200 have a cutting arc of +35 degrees to -22 degrees. A heavy spring establishes even flotation along the full length of the cutterbar in a variety of different field conditions and topography. The R160 and R200 Mowers attach to tractors with a Category 1 and 2, 3-point hitch. The R160 and R200 are not quick-hitch compatible. The R160 and R200 models rely on the parking stand to hold up 3-point hitch arms to ensure easy hook up to the tractor. 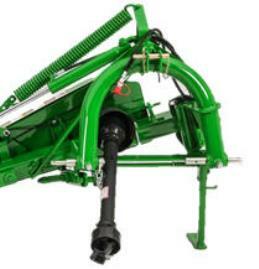 Lower hitch pins can be adjusted left or right to match the mower offset for tractors with wider tire spacing. The R160 and R200 models have an offset range of 172 mm (7 in.). 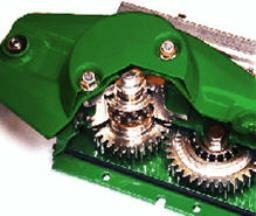 A multi-V-belt drive system transfers power from the gearbox to each rotary disc. Power is transmitted to the rotary discs through fully enclosed gears, running in oil, for quiet, smooth, reliable operation. All models have a spring-loaded belt tensioner for easier belt adjustment. 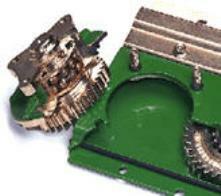 The belt tension automatically compensates for initial belt stretch, increasing belt life. Rotating at 2986 rpm, the high-speed discs cut in the toughest conditions. The low-profile cutterbar allows a close cut while maintaining a level cutterbar. The cutting height is controlled by adjusting the tilt of the cutterbar. The cutterbar is protected from severe impact should an object be struck. Disc quills are easily removed from the top of the cutterbar for improved serviceability.